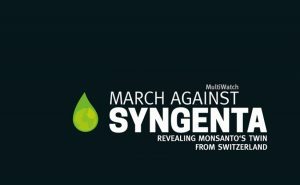 En avril 2016 la groupe MultiWatch a publié un livre noir sur la multinationale Suisse Syngenta en allemand. Maintenant la livre MultiWatch est paru en anglais comme eBook sur Amazon Kindle et autre. Pour les détails consultez: http://www.marchagainstsyngenta.org. The Swiss NGO alliance MultiWatch has collected a lot of information about the agrochemical multinational Syngenta. The English translation of “March against Syngenta. Revealing Monsanto’s Twin from Switzerland” is now available as an eBook by the Swiss edition-8 in Amazon Kindle Store and other digital bookstores. ISBN 978-3-85990-297-8 (epub) and 978-3-85990-298-5 (mobi). This book is a compilation of the team’s findings after one year of watching Syngenta, and also includes contributions by Vandana Shiva, Miguel Altieri and other guest authors. Many citizens from Basel in Switzerland were disgusted when they heard that their city canton’s government had selected Syngenta as the main sponsor of Basel’s appearance at the 2015 World Fair in Milan. The multinational agrochemical and agricultural biotechnology corporation stands for toxic pesticides, genetically engineered seeds, patents on plants and industrial agriculture, a main culprit of global warming. Soon after the announcement, NGO alliance MultiWatch organized Basel’s first ‘March against Monsanto and Syngenta’. The book shows that Syngenta is Monsanto’s twin.